The baccalaureate program prepares professional nurses who can practice in a variety of settings. The program leads to a Bachelor of Science in Nursing degree, which may serve as a terminal degree or the basis for graduate study. Provide basic organizational and systems leadership. Integrate evidence-based practice in nursing care. Manage healthcare data, information, knowledge, and technology. Demonstrate understanding of healthcare policy, finance, and regulatory environments. Facilitate inter-professional communication and collaboration in healthcare teams. Use patient-centered strategies when delivering care to diverse individuals and populations. Use data to monitor outcomes and improve care. Deliver safe care through system effectiveness and individual performance. Synthesize knowledge from liberal and baccalaureate nursing education to guide generalist practice. Graduates earning the Bachelor of Science in Nursing degree may be eligible to write the National Council Licensure Examination - Registered Nurse (NCLEX-RN). Upon passing the examination, the individual may be licensed as a Registered Nurse in the state they apply. 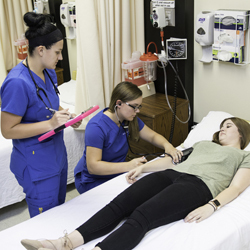 Request a transfer credit evaluation to find out how your previous college credits may transfer to any of the tracks to earn a Bachelor of Science in Nursing degree. The Iowa Code (Chapter 147.3) states that conviction of certain felonies will make an individual ineligible for licensure. Previous conviction of a felony does not automatically bar an individual from eligibility for licensure. After completion of a nursing education program, the student will file an application for licensure with a state board of nursing. At that time, the board of nursing may review any felony convictions to determine eligibility for licensure.